"If you get the latest version of the Level Builder (1.2.2) there is an option to turn off shadows and glows for keys and coins, I think on both a per-mansion basis, and individually. It does not run on Lion however, and you must "export" mansions to the HD format after editing. It adds to the work, but it's still at least possible to edit mansions if you have OS X 10.6 or earlier. See the FAQ (linked elsewhere on the forums) for info on how to export to the HD format. Oh and also, it would be good for custom mansion designers to use the new abilities in the 1.2.2 editor to fix problems in their mansions with the HD version. (For instance, some bricks that are used to hide things and cast shadows that shouldn't -- shadows should be disabled in these rooms.)" 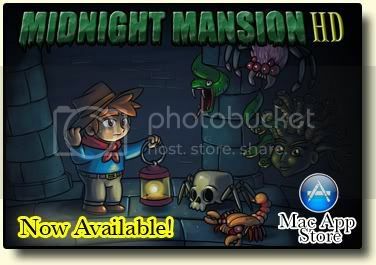 Does this mean we can now open the HD versions of mansions in this level builder? Or do you still have to work with the regular mansions and then convert with Rezycle? As I understand Vern above we still have to work with the old MM CM's and then convert them to HD with Rezycle. I am trying to open the Lever builder on my computer with Snow Leopard. I get this message as seen in the screen shot. The MLB is in the right folder together with the MM app and Game Data folder. s there anything I can do to make it work? The MLB has to be in the original MM1 folder, not the MM1 HD folder. It must also be in the root of that folder. Oh, I will move it. Thanks! Surcouf's writing (Daedalus, Cranes, Warrior's designer). As I understand, it is not possible to use MLB since I work on 10.7.2? I do not wish to add a signature to my messages!.. Hi Surcouf. You understand correctly. One possible work-around for developing future mansions (that would make it possible, but not a lot quicker, I'm sure) would be to partition your Mac's hard drive so you have a (smaller, maybe) section that you would have - as we would in the pre-Lion/aka Snow Leopard (OS X 10.6.x) days, and install Snow Leopard (10.6.8 or under) on it, and then to work on your new custom mansions, boot up under the Snow Leopard partition, where you could use the Mansion Level Builder app, other graphics programs of your choice, Recycle, etc. to build your mansion, screens, etc. Once you have all the part of your mansion ready, use Recycle to make the screens compatible for MM 1 HD, open your other partition (where the Lion or later version of macOS/OS X is) and copy the folder of files for your new mansion into a folder there - might be simpler to have a folder in the Desktop of your Lion+ partition (MyComputerName -> Users-> your name-> Desktop -> MyNew MM1HD Mansions, for example) and drag and drop the folder containing each mansion's stuff into it. Then you could test it under OS X/macOS on MM1 HD and make sure it works okay (and then beta test, & once 'done', upload the zipped file to the MM 1 HD servers here.